Cotton Robes by La Cera - La Cera presents this gorgeous long robe in 100% cotton lawn fabric. 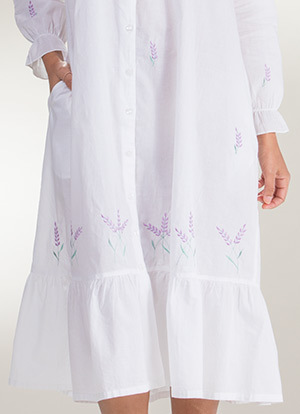 Available in Lavender Grove, a white gown with purple and green floral embroidery. This button-front robe can also be worn alone as a long sleeve nightgown. Care Instructions: Machine wash cold water on gentle cycle with like colors; use only non-chlorine bleach when needed; tumble dry low; steam or warm iron as needed.